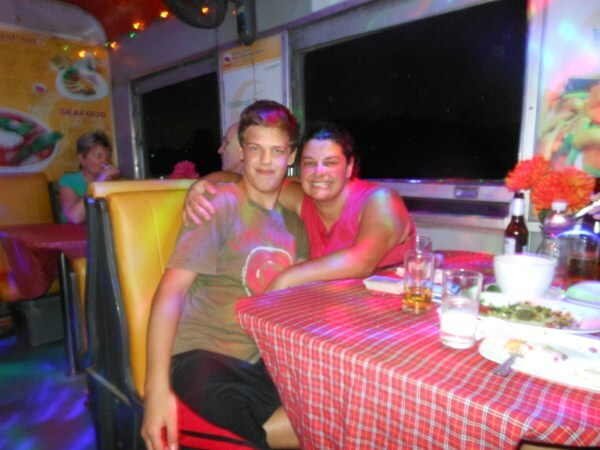 As 2012 draws to a close I have been thinking back through our year traveling around the world! I sit here in wild wonder at where we have been, who we have met, and the experiences we have all had! Instead of the run of the mill photo round up of the year I decided to start annual awards. Every year will feature different categories and all will highlight the best of our year! So here it is; our 2012 best of awards! No question at all on this one. 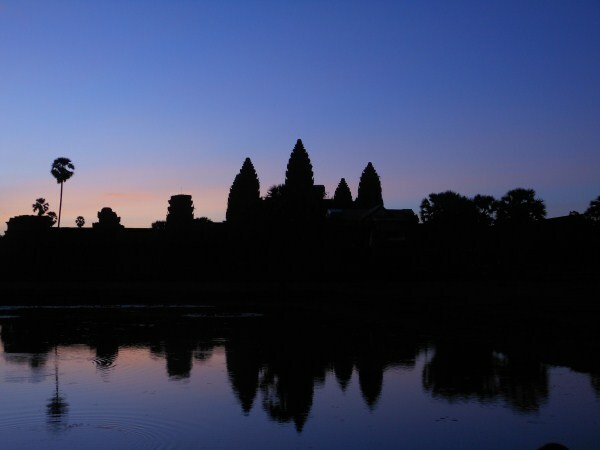 Angkor Wat would place first in a lot of different categories for travel. It is enormous, stunningly beautiful, historical and a must see on anyone’s itinerary in Asia. Easily our pick for first place. We spent 3 days exploring all the temples and I wish it could have been more. Be sure to do the sunrise morning, it is worth the 4am wake up, and it takes a lot for the night owl in me to admit that. A close second for us was also a UNESCO heritage site. 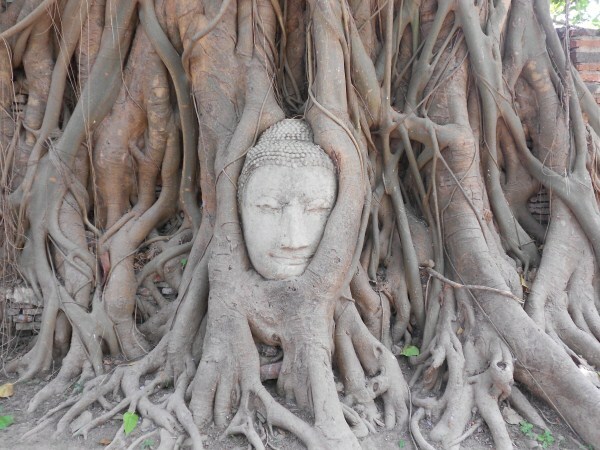 Ayutthaya, the former capital of Siam, is rich in history and full of stunning temples and ruins. They suffered a devastating blow during the floods in 2011, so supporting the town through tourism is a wonderful benefit to them. It is a landmark town worthwhile of the 1 hour train ride North from Bangkok. Warning: It is hot as hell there or at least it was in March so a room with AC is a must! We are not huge amusement park goers but this year we saw quite a few. 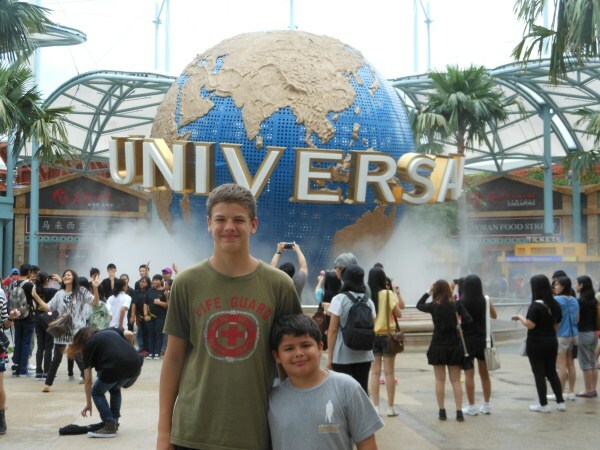 Without a doubt Universal Studios in Singapore takes first place. We spent the entire day going on roller coasters, 4D rides, watching shows, and so much more. It was definitely the highlight of our time in Singapore. Quick tip though; get the fast pass so you can skirt the lines, with a 5 year old that was a life saver! 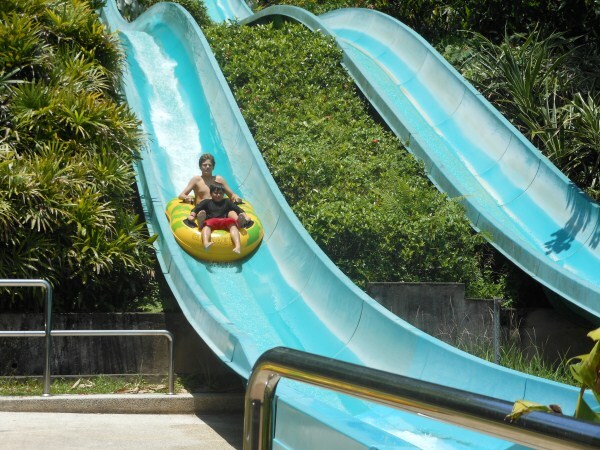 Runner up would have to be the Lost World of Tambun in Ipoh, Malaysia. Not anything like Universal but it had a charm of its own. We spent the entire day enjoying the waterpark, tiger feeding, amusement rides, hot springs, copper panning, and small Animal Park. The Lost World is really the perfect size park as even though it offered many different things to do, we never felt overwhelmed. 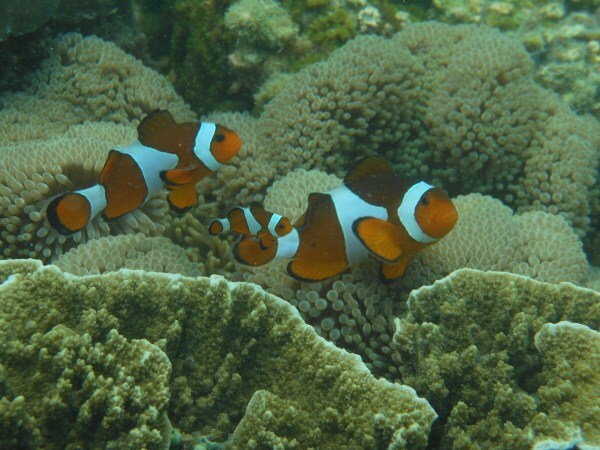 Snorkelling is one of my favorite activities. It takes a special kind of beach and ocean water to really make it stand out. One of the best places I have ever snorkelled and certainly the best this year was in the Perhentian Islands off the East coast of Malaysia. 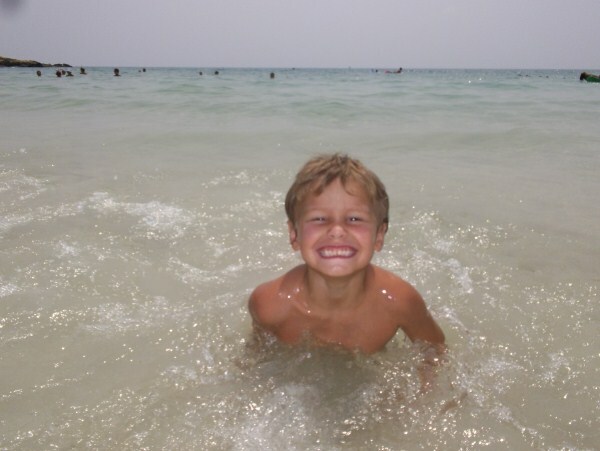 Beautiful secluded beaches and a reef directly offshore, so even the little guys can snorkel with no problems, made this an easy pick! 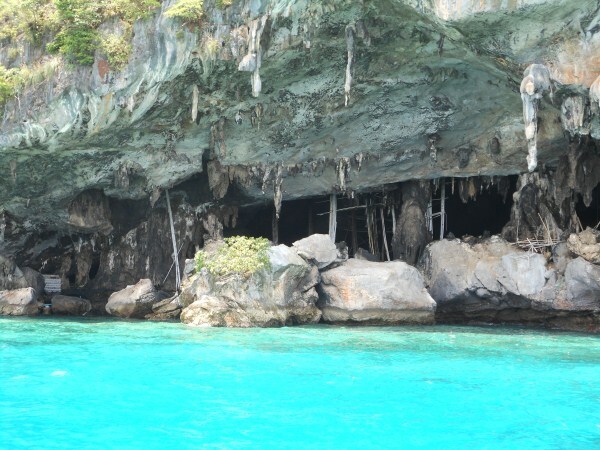 Koh Phi Phi Island in Thailand comes up in second place. The beach made famous by the movie “The Beach”, is absolutely stunning. An added benefit to the snorkelling was that we got to swim with some sharks while we were there. The noise and air pollution that is overrunning this beautiful spot took it out of first place for us though. The reef is slowly dying and it is hard to really fall in love with a beach when you can hardly find it behind all the tourist boats. One of the best days on our entire journey so far was in a cave. 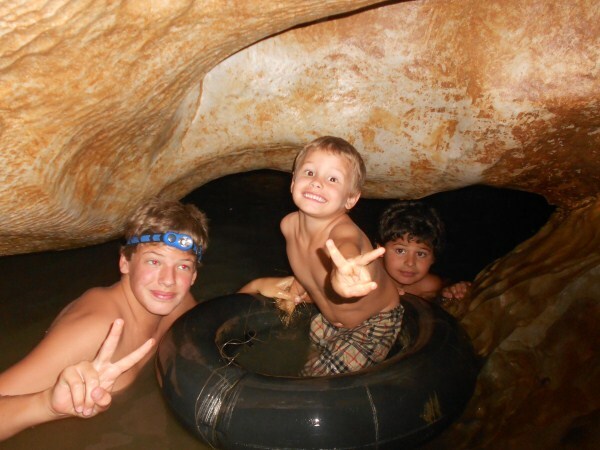 Hands down the best cave was an unmarked cave in a village near Vang Vieng, Laos. The boys helped each other, pushed me way outside my comfort zone, and we even got to swim deep inside this remarkable Earth cavity. A close second was a day we spent up in Northern Thailand in Tham Lod cave. Roughly 2 hours North of Pai, it was a beautiful motor bike drive up, where we were met with one of the most astounding caves I have ever seen. 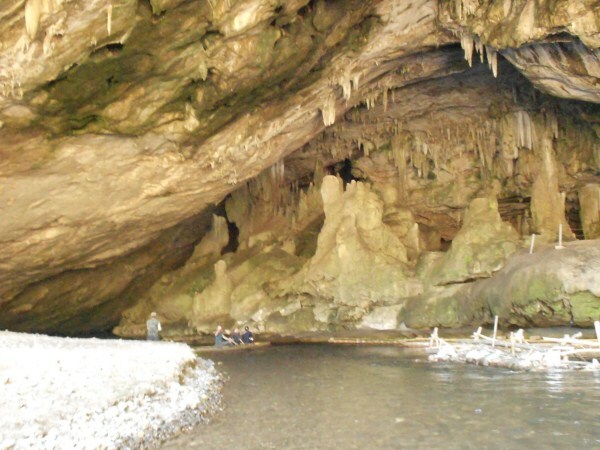 A river runs slowly through this massive cavern so you are able to take a bamboo canoe to navigate to various on /off points. It is definitely worth a day trip north! One day I will do an entire post just on the funny signs we come across. For now though I leave you with 2 of my favorites from this year. 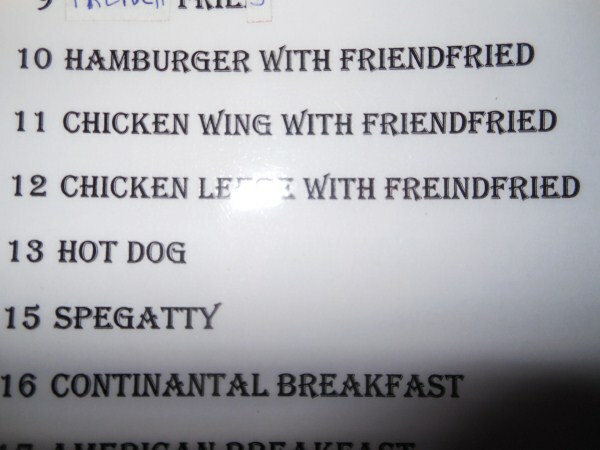 The first one is a menu choice from our hotel in Battambang where apparently they serve up your friends rather than French fries to go along with your meal. During our stay they also were convinced that apple juice was the proper name for ketchup. Confusion ruled the meals, in a fun way! Bathroom signs and bathrooms themselves are always something interesting in Asia. TP or no, squat toilet or western, you never know what you will get. 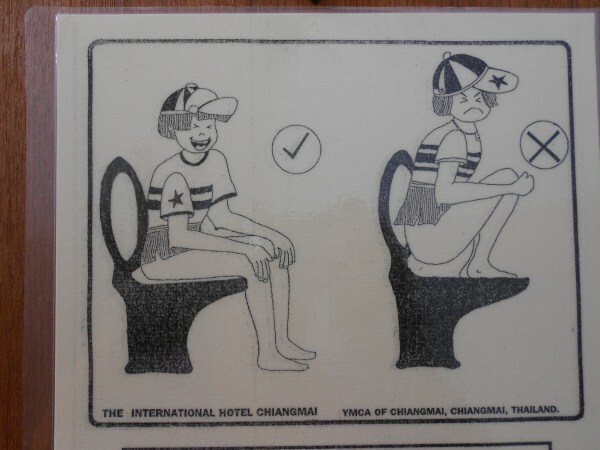 This instructive sign was found in Chiang Mai, Thailand and the faces in the sign as well as the need to explain this process just cracked us up! I’ll split this one up. Best hawker market food we have had is Long Beach in Penang. Hawker markets are basically street food that is set up all under one roof. 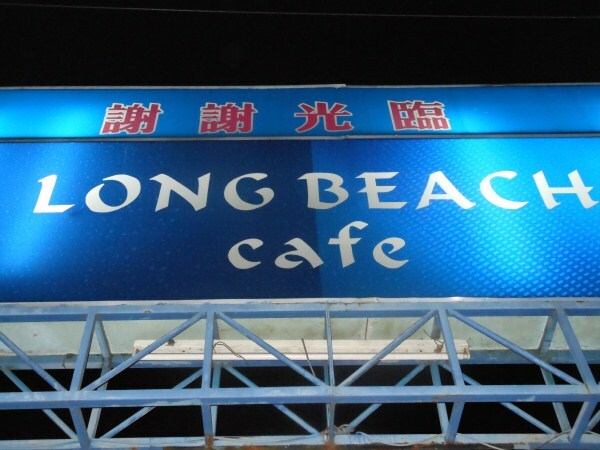 They offer everything from Chinese food, Satay, Western food, soups, roti, etc. It is fast, cheap, and mostly delicious. 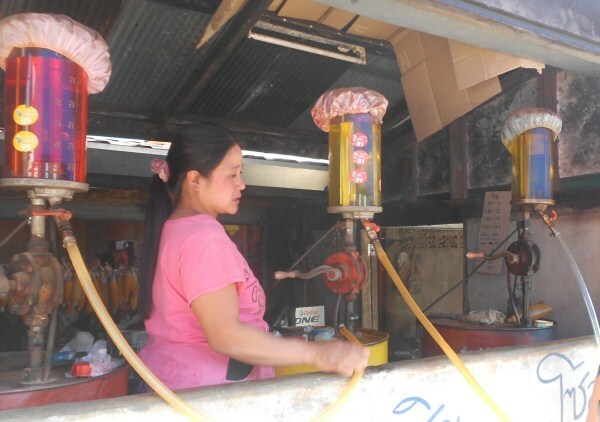 You can find hawker markets all over Penang but in our experience Long Beach in Batu Ferringhi was the best. When you travel all the time in strange and exotic locations things just do not always go the way you expect. Actually what we have learned is to not really expect anything and just live in the moment and go with the flow. But it is from our, let’s say, misadventures that our most used phrases come from. “This is going to make a great story…someday!” Used most often during bus travel but not exclusively reserved for those trips, this phrase sees a lot of action in our family and really helps us through the less exotic parts of full time travel. “What is going on here”, or “what is this all about”, comes out often as well. Asia seems to be the capital of random things put together and it is often times impossible to decipher the connection…hence the phrase! Since starting our trip we have taken countless train journeys. Some were short and others quite long but they have all been comfortable, exciting, and fun! The first place spot is held by a train unlike any others. 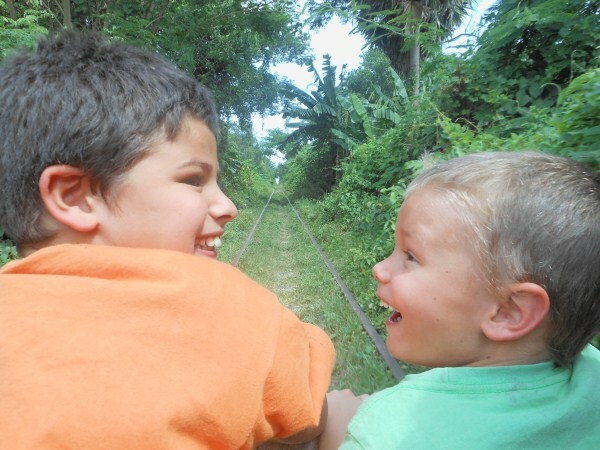 In Battambang, Cambodia, for a very reasonable rate you can ride on the bamboo railway. A creative way to make use of the railroad after it was ruined for actual trains in the 1970’s. Locals transport goods and run bamboo train tours out to a local brick factory. It was exhilarating as we took off from the “station” and quickly realized how fast this thing could really go. Even more exciting when you realize it’s only 1 track for 2 way traffic…have no fear you simply pay attention and disassemble the train when another train carrying more passengers comes by. In second place is one ride from Bangkok to Chiang Mai. We have taken this route several times over the year but this particular train ride was the most fun we have had on a train. It was just my oldest son and I and after seeing that our seats were not so lovely we decided to find the restaurant car. To our delight it turned into a nightclub after 8pm and we ate, danced, drank, and had a great time meeting other travellers. Not much to say on this category. We have seen a lot of sunsets over the year and even more sunrises than ever before in my life. Without a doubt Penang takes first place in this category. We were lucky enough to have a view of the sunset over the ocean every single day for months. The only problem was picking my favourite sunset photo. 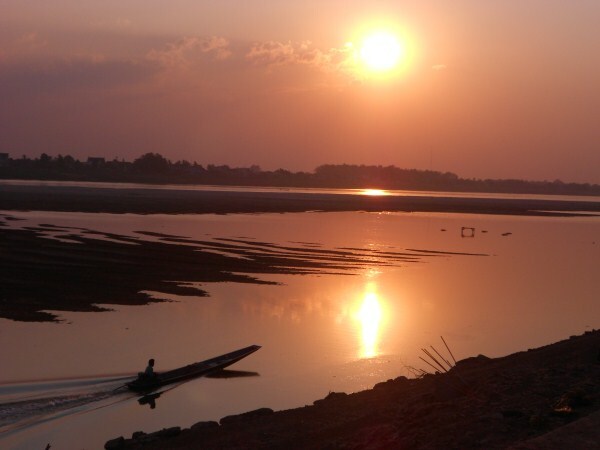 Coming in as runner up has to be the sunset over the Mekong River in Vientianne, Laos. Loads of people converge on the steps down to the river to watch in amazement as Mother Nature paints a sunset night after night. It is incredibly peaceful to sit among locals and watch. No award ceremony for 2012 would be complete without at least 1 mention of Gangnum style, the K-pop sensation that seemingly has been sweeping the world over. Now I have not actually seen the real video, which has topped over 1 billion views on YouTube but I am still familiar with the song. As my 9 year old and I made a quick stop into the Gurney mall in Penang, we heard the music begin to blare and made our way to the center court of the mall to find a full blown flash mob. I have always wanted to see or be in one so this was such a treat. We watched, we videotaped, and here we are sharing the video of the best flash mob we saw this year. In second place, yes we actually saw 2 flash mobs this year, is a Christmas flash mob that we saw in a small mall on Langkawi Island, Malaysia. At a time when I was not feeling very much in the Christmas spirit it really brought tears to my eyes. I was at the mall to work so unfortunately did not have a camera and didn’t capture it. Two separate times this year I or another mom has remarked that what we were watching was a true Lord of the Flies moment. 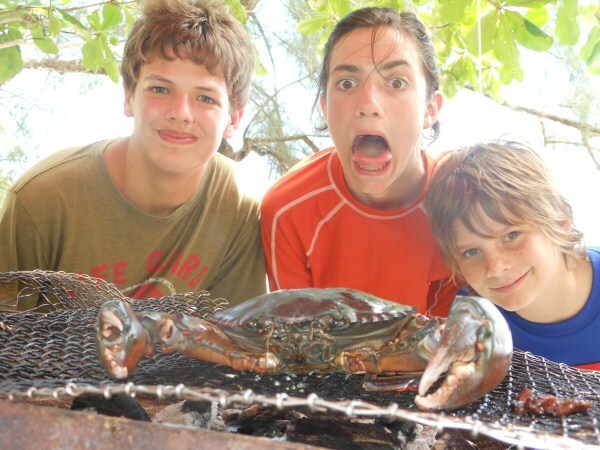 First place goes to my son and his friend, who within minutes of landing on Monkey Beach spotted, captured, killed, cooked, and ate a humungous crab. I do not like crab usually but we all had a taste and something about the freshness made it scrumptious. While tubing down a river in Laos we came across several locals doing what they do every day; watering their buffalo, washing their clothes, and fishing. But the thing that struck us as a LOTF moment was when we came across these young boys in their underpants and spears trying to catch an evening meal. Best beach seemed a category we just had to include since we have spent the majority of the year on a beach. This was a hard one to choose but when looking at the beauty, fun and resources of the area the first place award has to go to Koh Samet in Thailand. 3 hours to the East of Bangkok and set in the gulf of Thailand this small island packed a huge punch of fun. Beautiful beach, food vendors and massages available everywhere, restaurants on the beach complete with cushions for maximum comfort, and best of all daily fireworks, nightclubs, and amazing fire shows. Needless to say, we had a great time! 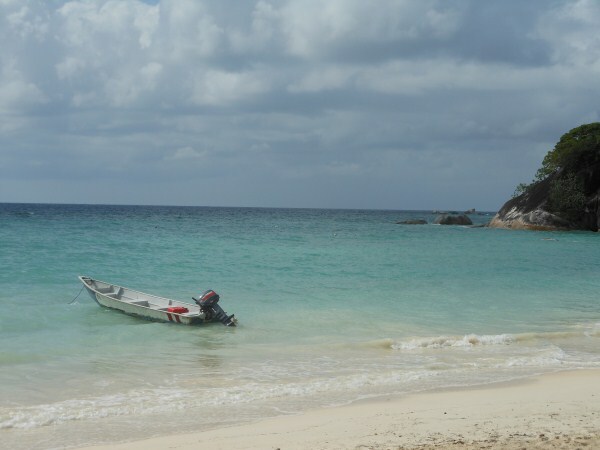 Second place goes to the Perhentian Islands, which also snagged an award for best snorkelling. This Malaysia Island set is serene, striking, and the most relaxing place we have been so far. Although there are pretty much only tourists there it is never busy or overrun and most of the island doesn’t even use electricity for the majority of the day. We had a wonderful stay and would not hesitate to go back. 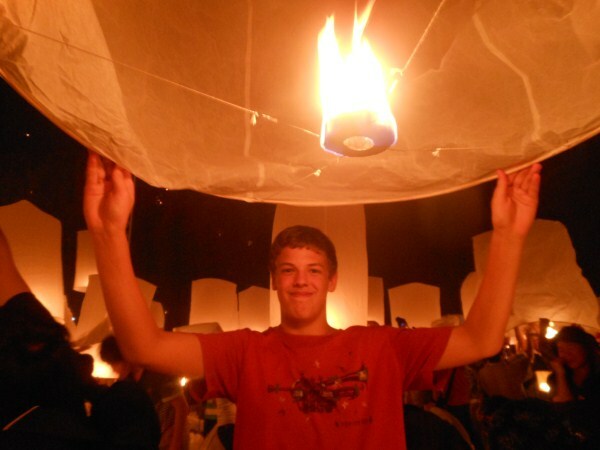 Unquestionably the winner here is the Yi Peng festival that we travelled 100 hours to see! It was beautiful, peaceful, magical, and downright life changing. Anytime you are even remotely in the area be sure to head up to Chiang Mai, Thailand and partake in this amazing festival. It was probably the best thing I did the entire year! 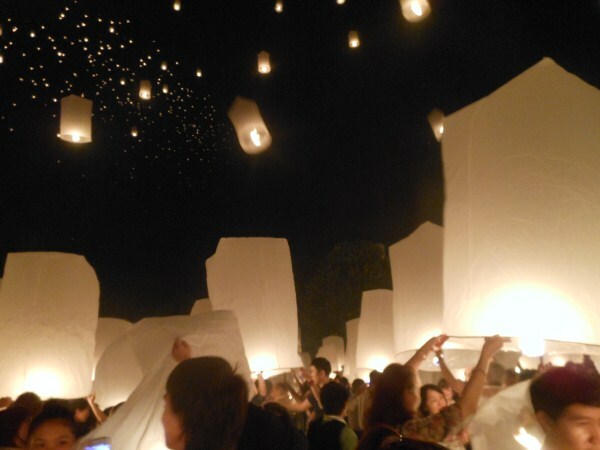 Runner up in the category is the Chinese New Year celebration also in Chiang Mai, Thailand. There were acrobats, dragons, and a parade that wasn’t too overwhelming but still fun. Nothing really amazing but we had a great morning celebrating! Trees are possibly the most enchanting things on the planet in my opinion. They shock and amaze me on a regular basis. They are also the thing that pictures just cannot seem to capture. The magic and grandeur is just lost and you really need to be there to get the full feeling. 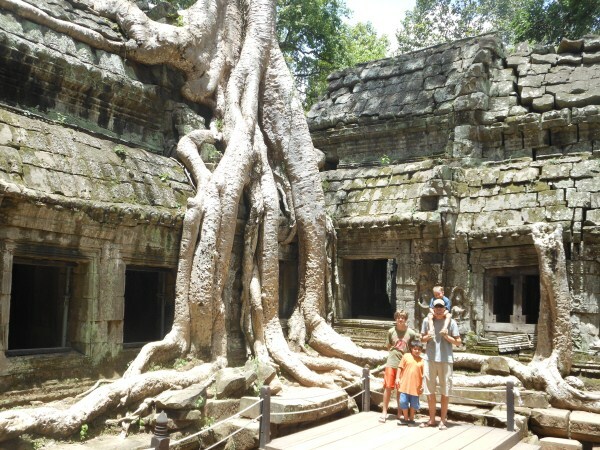 First place award for trees goes to the silk cotton trees that envelope the ruins at Ta Prohm in Angkor Wat. This Cambodian wonder truly needs to be seen to be believed. The runner up was tough to choose but in the interest of showing something different I decided to choose artificial trees. 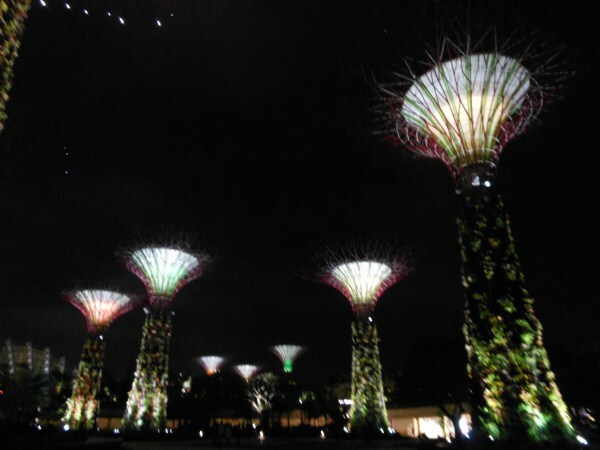 The Avatar like trees in the Gardens by the Bay in Singapore will amaze you. Take my advice and be sure to head there next time you are in Singapore. They are directly across the street from the Marina Bay Sands making an evening visit breath taking! There is no shortage of gross things that Asians eat on a stick. They do not waste anything and we have seen embryos, baby chicks, tarantulas, and numerous types of bugs. But the winner of this category has to be the bats on sticks that we saw in Laos. Maybe if it was just the meat it would not have been so unthinkable to eat but when you could still see the hair, teeth, and claws it, well, it takes the place as winner of grossest food on a stick! 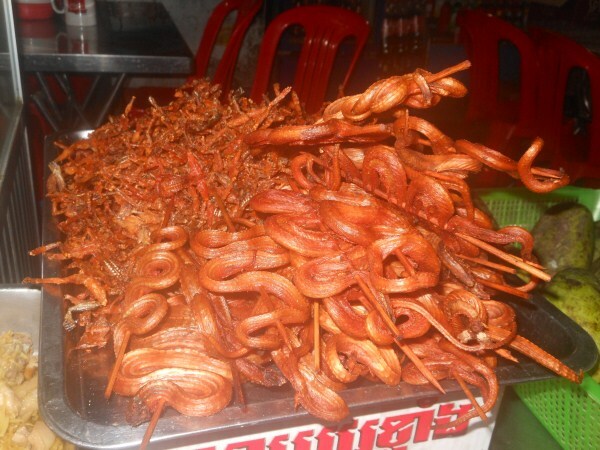 A close second, and this was a tough choice, has to be the snakes on the stick that we saw in Cambodia. Do I really need to say more here….just look at the picture! Yuck! We have enjoyed a lot of amazing animal encounters this year but 2 stand out quite a bit as the level of interaction was not something you would ever find in the US. 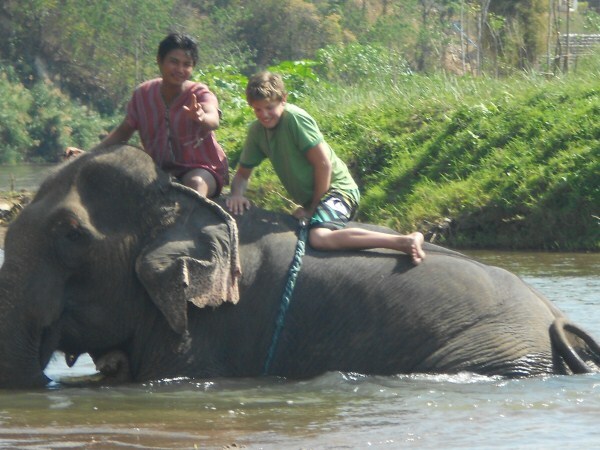 First place goes to our time with the elephants in Pai, Thailand. Frolicking in the water, feeding them and just being in their presence in such a close and intimate way was just spectacular! Second place is our time spent at the Orangutan Island in Bukit Merah, Malaysia. It is a rehab facility that really cares for and tries to reintegrate the primates back to their wild habitat on Borneo. We could have stayed for hours watching them play but our favourite part was watching the different personalities in the toddlers and pre-schoolers. 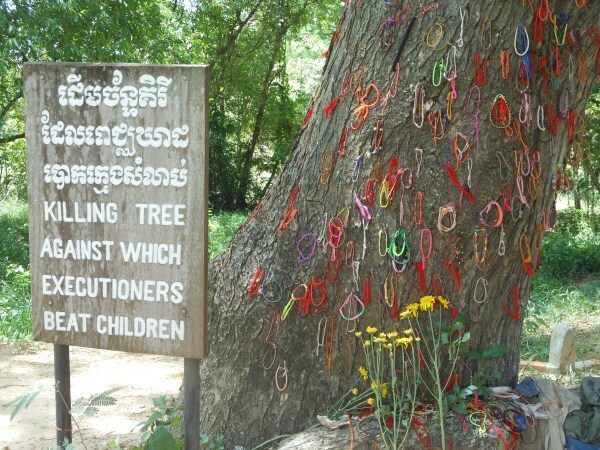 The award for this category goes, hands down to the killing fields in Cambodia. You cannot walk away from that place with the same feelings about humanity as you have when walking in. It is done beautifully and respectfully but was without a doubt the hardest day I have spent on the journey. I would NOT recommend it for children under 12 as it is very deep subject matter and a level of respect and quiet needs to be displayed. Second place goes to the Yi Peng lantern festival, where for a brief moment we actually felt the negativity of the planet rise to the skies and felt a magical Peace overcome us. As I said before if you are ever in the Thailand area in November this is a must see! An extremely popular saying in Costa Rica is Pura Vida, it is said throughout the Spanish community but in Costa Rica it is everything from a way of life to a greeting! We have actually run into this saying several times since we have been in Asia. 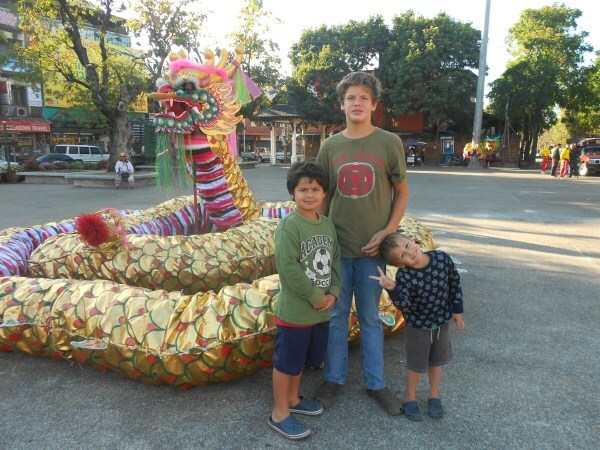 Our first month was spent in Chiang Mai. We explored every inch of that city and in our travelling around we came across the words “Pura Vida” spray painted on a wall. We were shocked and delighted, took many pictures, and now consider it an award winner. It is a random category, but a winner none the less. 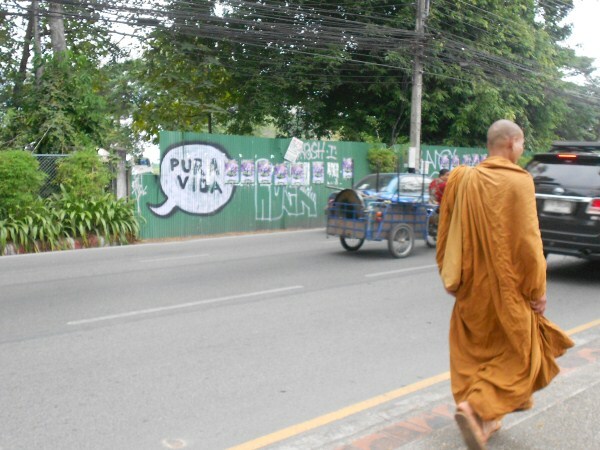 In Pai, Thailand we also came across the words Pura Vida. 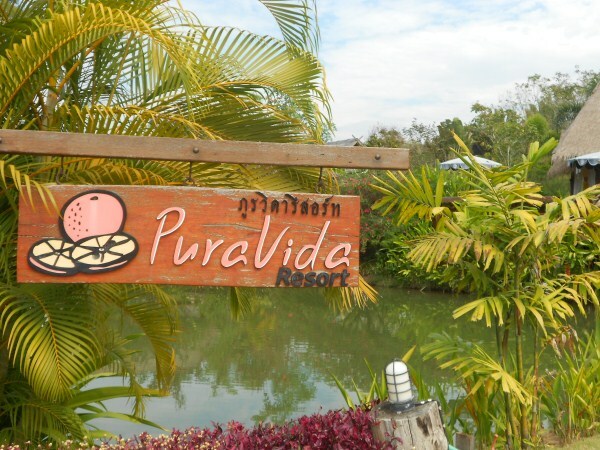 There is a hotel overlooking a beautiful rice paddy called Pura Vida. The property is stunning and really seems to fit the saying, pure life! In the 12 months of 2012 we spent over half that time in countries that are predominantly Muslim. That has availed us numerous opportunities to visit Mosques. 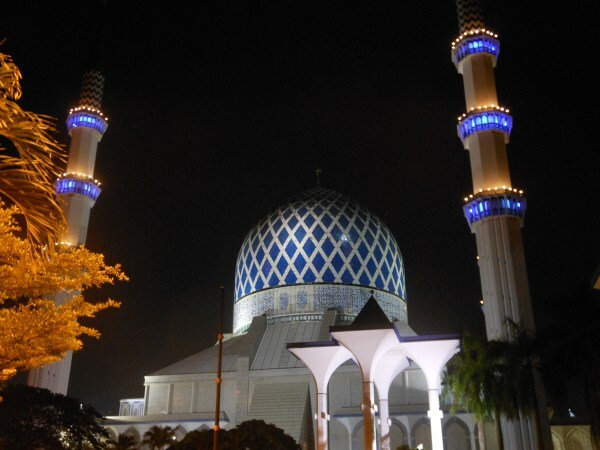 The Blue Mosque in Shah Alam, outside Kuala Lumpur, Malaysia is the winner for us. It was so much larger than we had been expecting and absolutely stunning. We spent 2 hours there listening to the Iman, and oohing and ahhing at the splendor and grandeur of the walls and floors around us. Word of warning; be sure to pay attention to exactly where you take your shoes off upon entering. The Mosque is so huge that we actually lost our shoes for over an hour. Our runner up is the Masjid Kapitan Keling, the oldest Mosque in Penang. Georgetown Penang is a UNESCO world heritage site and there is good reason for this distinction. It is a wonderful place to soak in religion, history, and culture and a perfect spot to enjoy a day or 2. 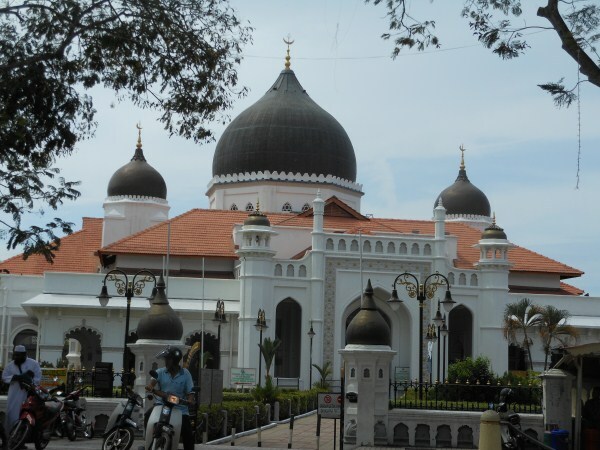 The Keling Mosque is beautiful and worth stopping by to see. There is usually a guide there to show you around and explain things, which is helpful as it is sometimes difficult to know the right way to behave in a new religious environment. Do not go on Fridays, the high prayer day. We have seen a lot of amazing structures and figures made out of gold over the last year so this was also a hard category to pick the two winners for. 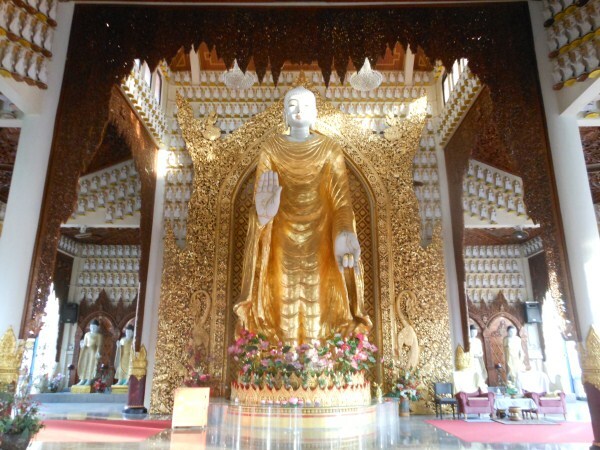 In first place is a magnificent golden Buddha statue housed at the Burmese Buddhist temple in Penang, Malaysia. We were shocked at how beautiful the entire grounds were but the Buddha and the temple it is housed in are simply magnificent. 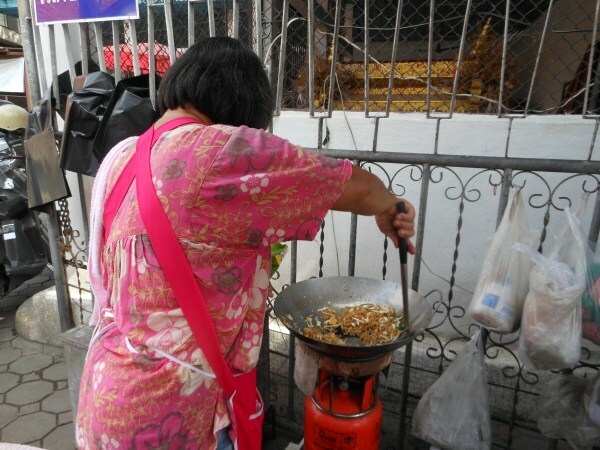 A close runner up is one of Chiang Mai’s largest attractions. 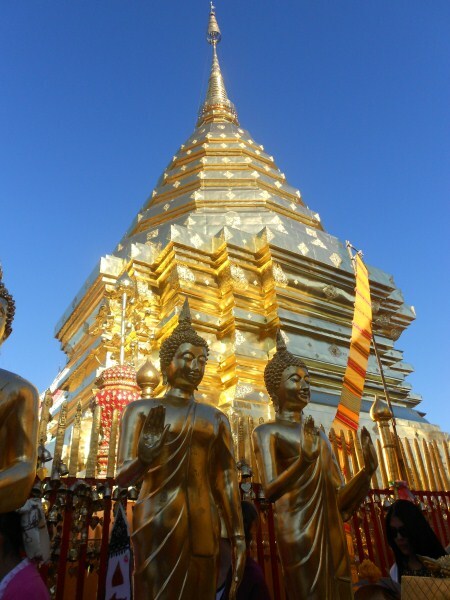 On Doi Suthep is a stunning and spiritual temple. The centrepiece of the temple grounds is a huge golden chedi flanked by countless Buddha statues also golden. It is special chedi where you will find people circling in meditative contemplation. It was extremely spiritual and peaceful to watch. 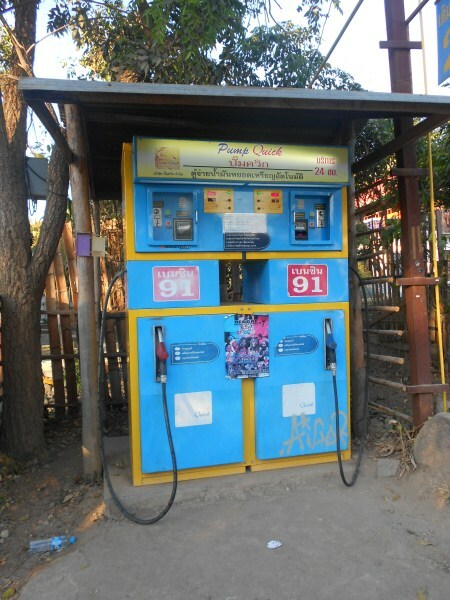 Our last category seems random but honestly we have seen so many cool and downright dangerous ways to pump gas in Asia. Our first place winner is insane, basically a metal drum with a hand crank on it. This definitely wouldn't pass any safety standards in the US but hey it works so why not! Not sure about the shower cap but I bet its a cheap fix for something! Start to finish this has been an amazing year, our first of nonstop travel. We visited 5 countries, 23 destination towns, and experienced countless outings. It was a wonderful year and we cannot wait to see what the New Year brings. What are your travel plans for the 2013?? Follow our adventures on Facebook and Twitter! I love the way you've tackled your year in review. I'm totally with you on the best snorkelling being in the Perhentians. You've got me longing for South East Asia again!! Great list! We recognize some of your awards, but most of all I am glad that we will most probably go to Cambodia and see Angkor Wat next year! I would also love to chat with you a bit more about the killing fields, from a traveling family perspective as you can understand. But first our plans take us to Barcelona next month! Thanks so much and enjoy Barvelone. That was my favorite city in Spain by far:) I would love to chat with you about Cambodia, it was really an amazing place. Feel free to email me or chat me anytime. I will always remember Long Beach nights with you. Great post! Thanks Erin, great nights for sure! What a fun year! What a fabulous post. It took me down memory lane and I would agree with many of your top picks Thanks for sharing this with us! You guys have had an awesome year. And remembering the past is surely a fun thing and I wish you guys the best for your upcoming expeditions. 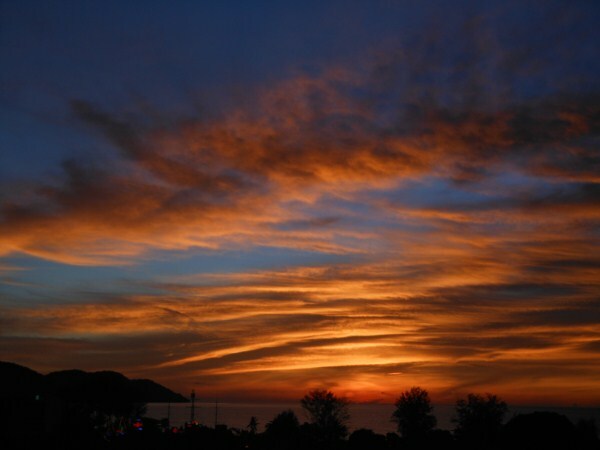 I almost forgot about those Penang sunsets! Look forward to what 2013 brings! Yes they are magical most evenings! I haven't come across your blog before today but it's apparent you have some great experiences as a family. I love the way you did the wrap-up of 2012 too. 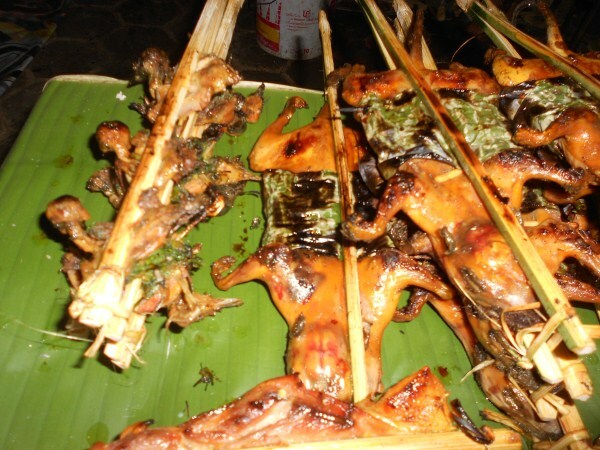 Your food photos of snake and bat on a stick leave me with little appetite. Hope 2013 is another spectacular year of traveling. Great list. I thought I was brave eating the pork brain. We'll definitely have to take that night next time. Looks funky.